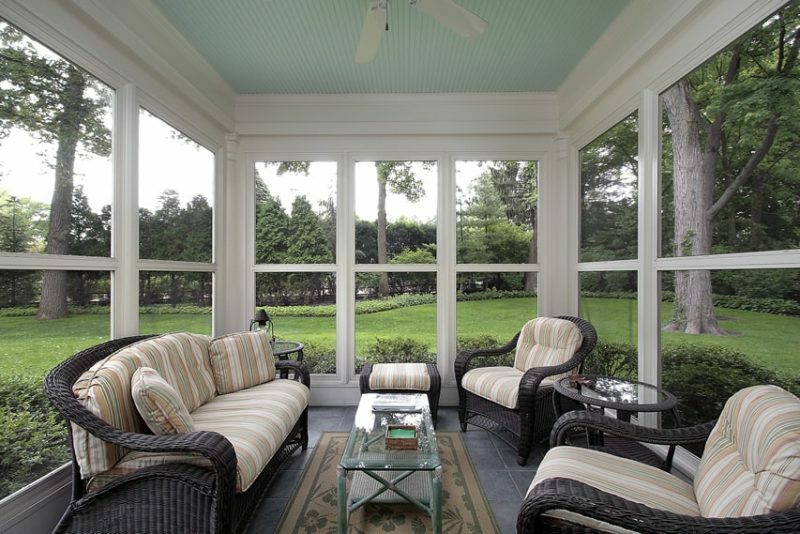 A sunroom addition to your home is similar to a mix between a backyard patio and a living room. 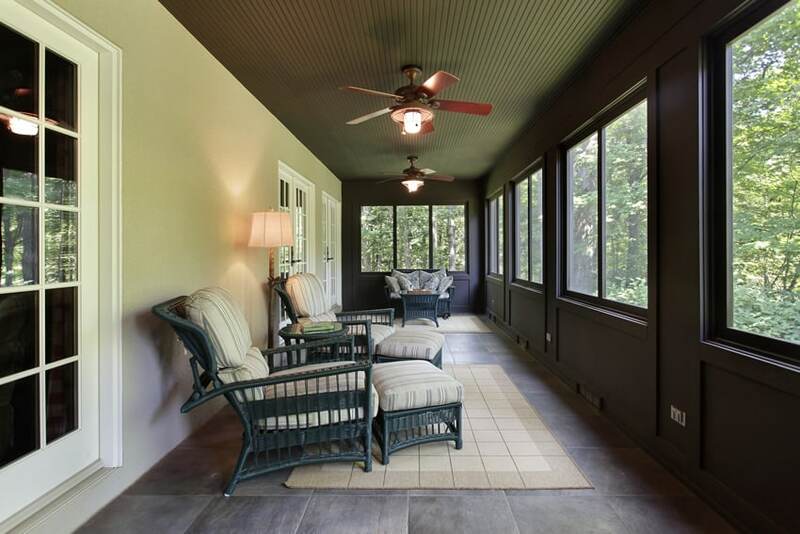 The best sunroom designs bring the outside in and allow you to enjoy the outdoor feel anytime of year.Below are some of out favorite sunroom ideas including different types of furniture, windows, paint colors and decor. 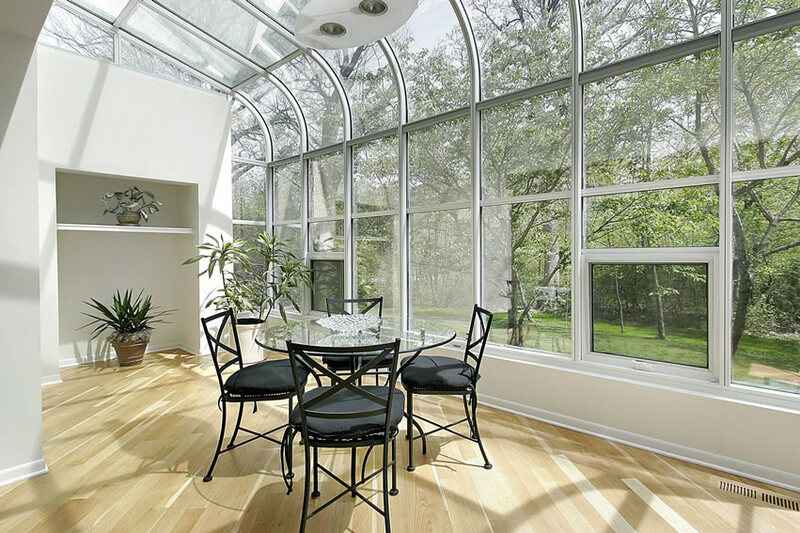 In the picture above, the sun room’s walls are almost all-glass, giving an impression that the room is actually open and not enclosed. Seemingly surrounded by trees and lawn, the sun room also makes use of outdoor-appropriate furniture to complete the feel. It has a set of sofa, 2 armchairs and 1 stool made of rattan in a dark wengue finish and a bamboo coffee table painted in a light emerald green color complementing the paneling on the ceiling. Windows – Large windows are one of the most important features and there are many different types, materials, and quality to choose from. Choices include single-pane, double-pane insulated, Comfort Gard, Azuria (blue glass tint), bronze glass tint and many other styles can let you truly bring the outside in where you can appreciate it. Windows should also be equipped with screens to maximize air flow, and keep out insects. A popular choice is aluminum screen rolling panels that allow one to easily create a screened-in porch feel and enjoy the outdoor environment. Along with screens, polypropylene weather stripping is an important addition that will help keep out moisture and provide draft protection. Flooring – Popular choices for floors are ceramic tiles because they don’t fade in sunlight and are easy to clean, weatherproof carpet, and natural hardwood floors. Shades – Window coverings can cut down and control sunlight glare, provide privacy, help maintain a cooler temperature, cut air-conditioning cost, and improve the energy efficiency of the space. Some top choices are wood & bamboo blinds, honeycomb or pleated/cellular shades, and custom shades for covering unusually shaped windows and skylights. Ceiling Fans – Fans can allow air circulation by creating a gentle breeze and reduce the need to run an air conditioner when it is warm. When it is colder they can also help by circulating warm air from the ceiling down to where you are sitting. 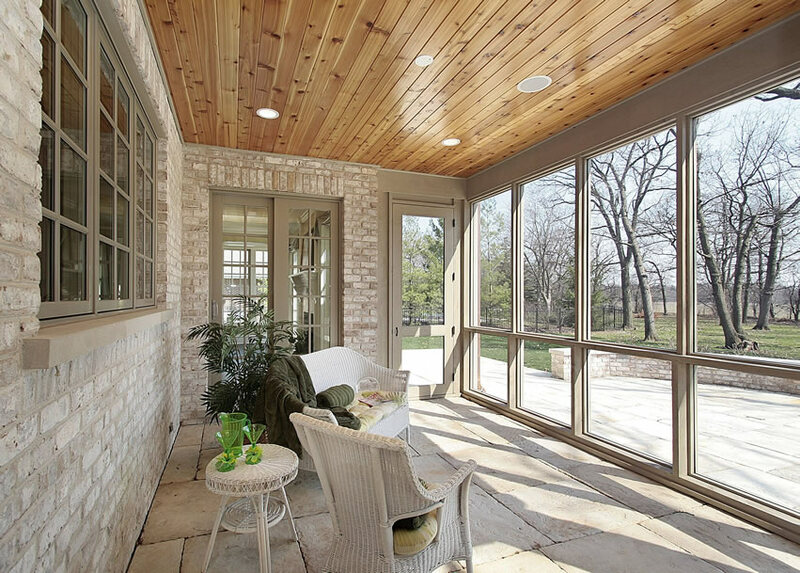 Ceiling – Many sunrooms opt for a traditional wood roof which is low maintenance and attractive. Other popular choices are sloped or gabled all-glass ceilings, sloped/gabled insulated panels, and patented glass panels to allow in even more sunlight. 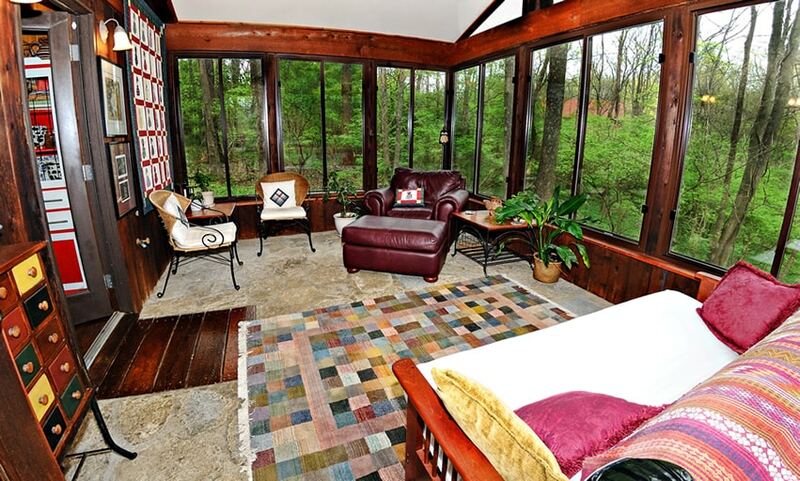 The sunroom pictured above is furnished with a unique combination of mid-century modern pieces and wooden antiques. 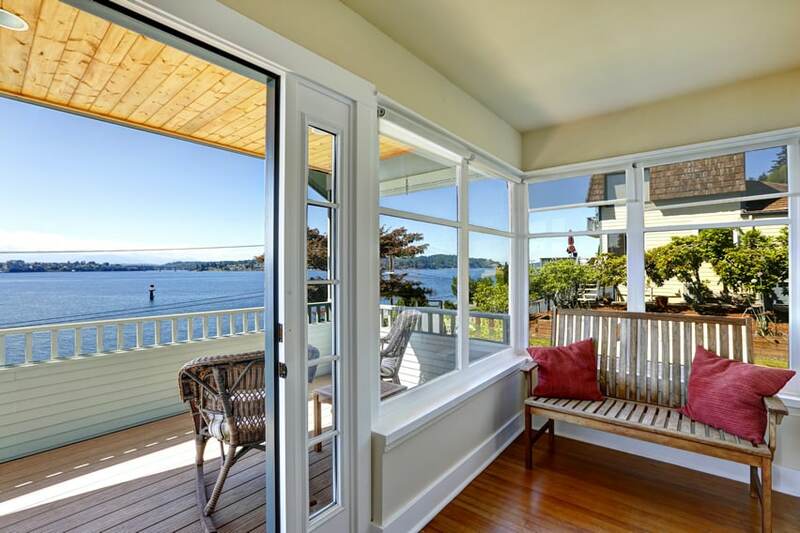 Walls are flanked with large picture windows, revealing the beautiful coastal view and the small balcony/patio area. 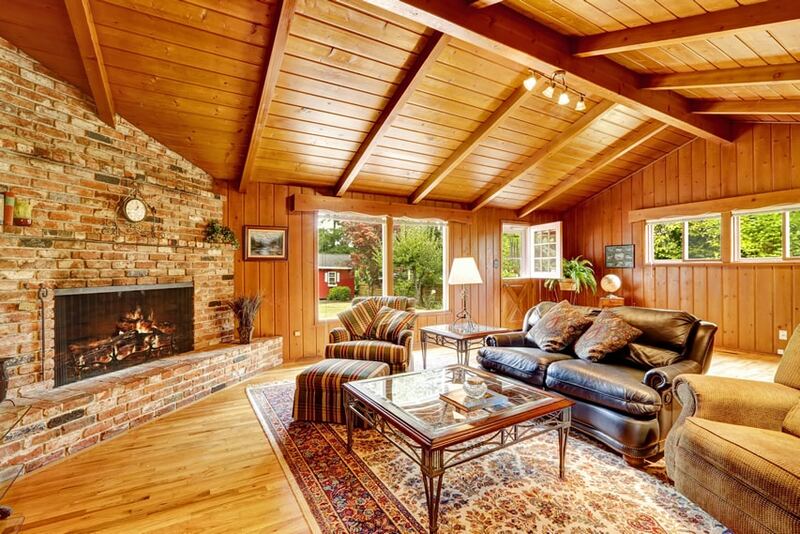 It uses a mid-century modern sofa with a solid wood antique table in the middle. 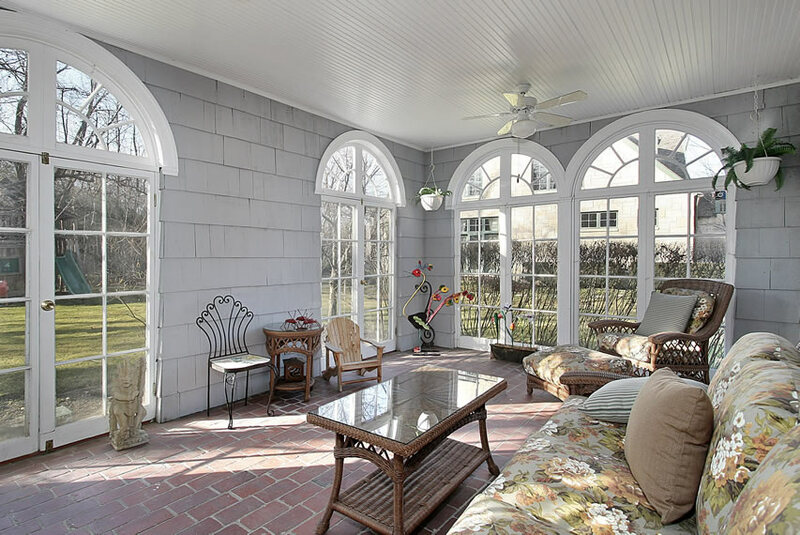 A small sun room perfect for relaxing, surrounded by large French doors and windows to reveal the surrounding garden. The room is painted in a light green color giving the space a cool tone to complement the warm red of the mahogany wood floors. It is sparsely furnished with a 2 lounge chairs with ottoman made from weaved rattan and one round side table in mahogany finish. You don’t need full-height windows to fully enjoy the sun. In this case, a couple of casement windows placed side by side and large French doors will do, and will still give the room enough sunlight and an outdoor view. Inside, it is painted with a greenish gray paint, has teak wood floors and uses fully upholstered rolled arm sofa and armchairs with a nice traditional area rug to go with. 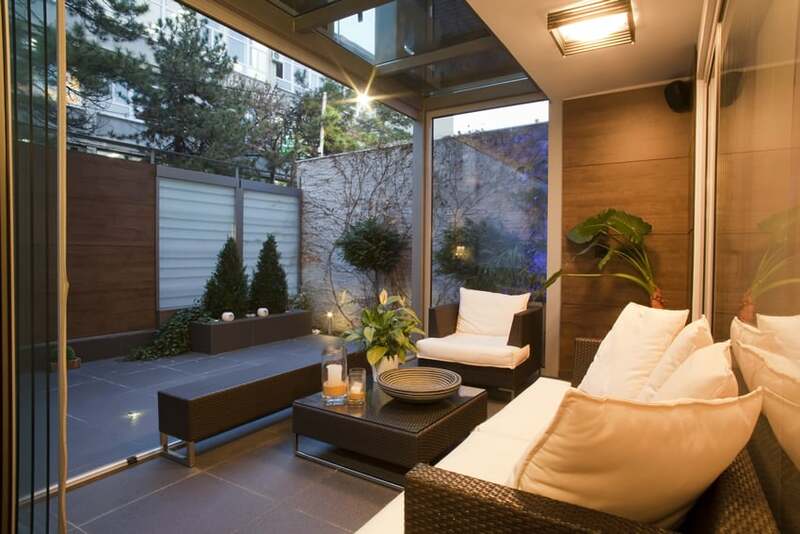 Plants are also integrated as accessories to the space, enhancing the outdoor feel of the space. 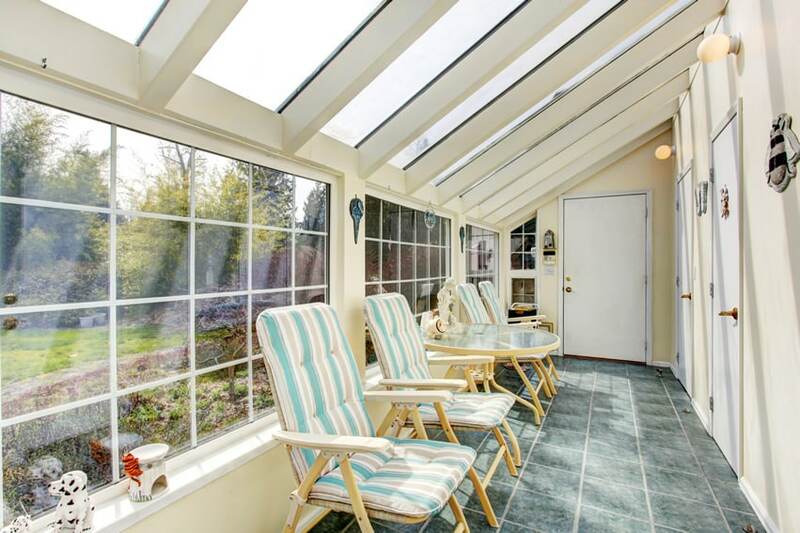 This sun room is like a patio area, enclosed with windows and doors. The front side is flanked with floor to ceiling windows, revealing the view outside, while inside, you will notice that it uses the same stone flooring material as the outside area. The furniture used is rattan painted in white, enhancing the outdoor feel of the room. A patio-sun room hybrid, but is more modern in design aesthetic, this room boasts of large frameless picture windows giving you the maximum unobstructed view. There is also a canopy extending beyond the house’s eaves, with clear acrylic roofing, creating a skylight window for the small space. The furniture pieces are made of synthetic rattan in a dark wengue color with stainless steel legs and weather-proof fabrics. 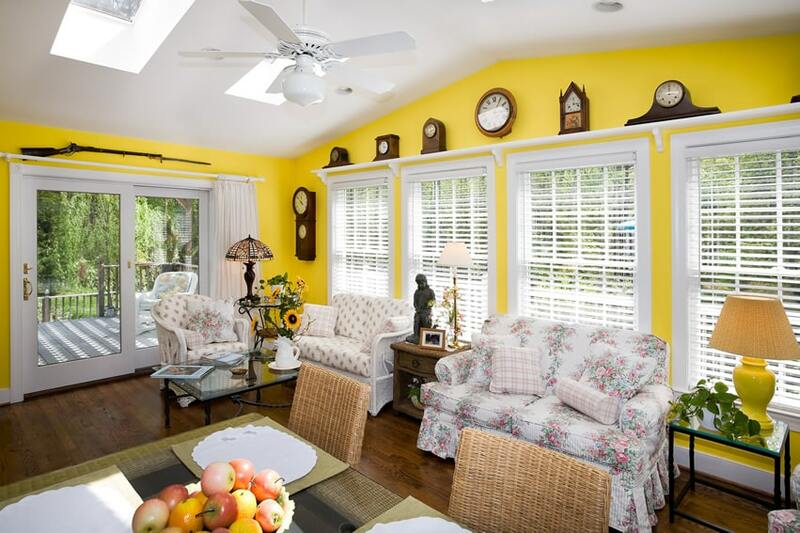 This little sun room is surrounded by large French windows providing a good view of the outdoors, while the inside is painted with yellow and furnished with a combination of rattan furniture and wooden rocking chairs. To make it look uniform, the seat cushions are all upholstered in a teal color. 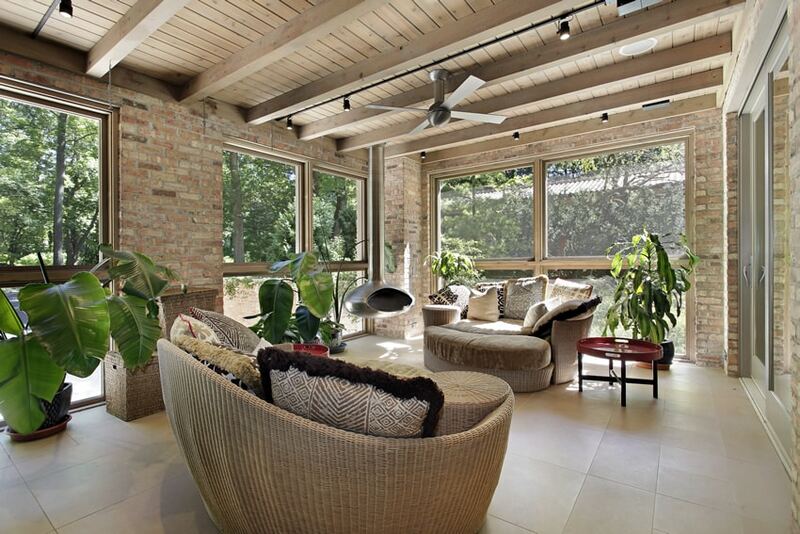 An example of a patio area which was walled and converted into a sun room. You could see the brick finishing of the house on one side of the wall, combined with the vertical wood sidings of the extension walls. It has large picture windows with a sliding window opening at the lower portion for ventilation and it is furnished with rattan pieces in a dark mahogany color with white upholstery. 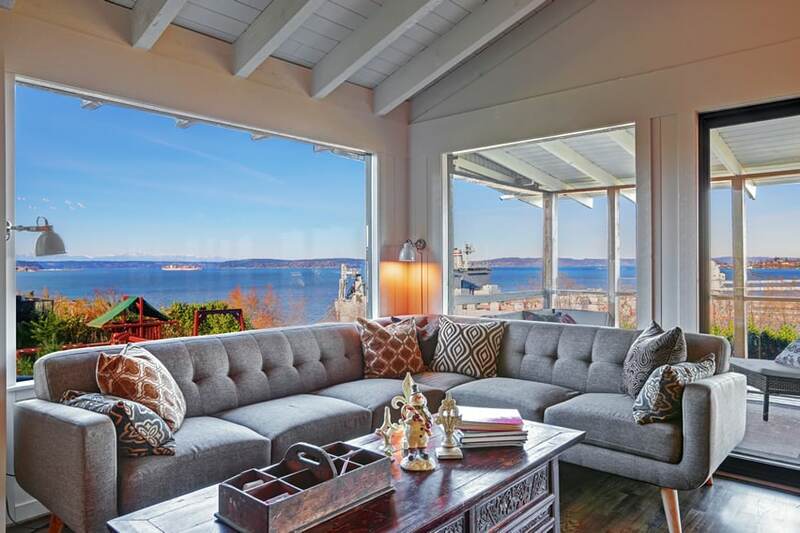 This small sun room is directly connected to the patio area, revealing a nice view of the lake. It has large casement windows and a picture window, offering a spectacular outdoor view, and also has roller blinds in case there’s too much sun. The walls inside are in a light yellow color, and it only has one furniture piece, a weathered wooden bench with two accent pillows. A unique and interesting sun room, using all-wood finishes for the entire space. Floors and walls and even the windows are all made from Teak wood kept in its natural color. In the middle, instead of seeing a sofa, a lounge chair or other common furniture pieces, this room attaches a Teak wooden bench to metal chains, hangs it on the Teak trusses and creates a fun indoor bench swing. 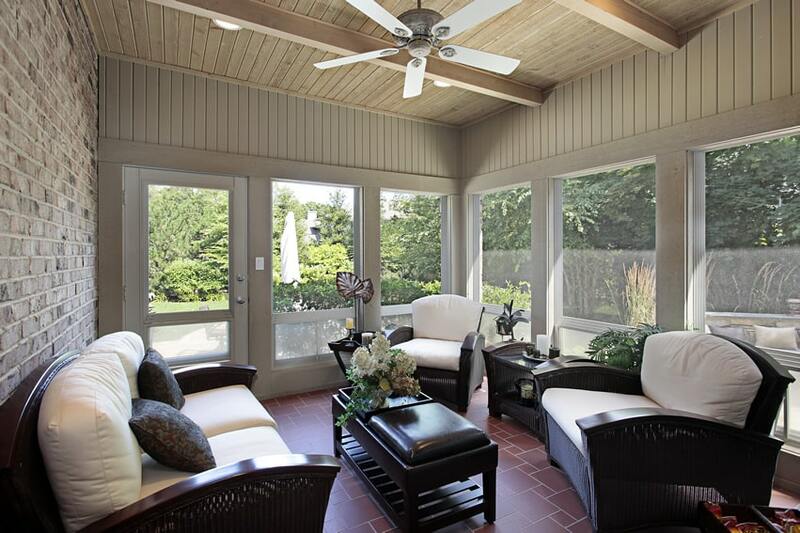 This sunroom, like the previous samples, is like a covered patio area. The walls are finished with the same brick material as the exterior of the house, tiled with matte ceramic tiles and most importantly, surrounded by large windows. Inside, it is furnished by rattan furniture pieces with organic forms in a natural light beige color and surrounded by indoor plants, adding a more outdoor feel to the space. This little sun room goes for the darker finishes, using dark-colored ceramic stone flooring, combined with dark mocha paint for the walls. It is sparsely furnished, with 2 lounge chairs, a bench and a side table, all made from rattan and painted in a dark gray color. 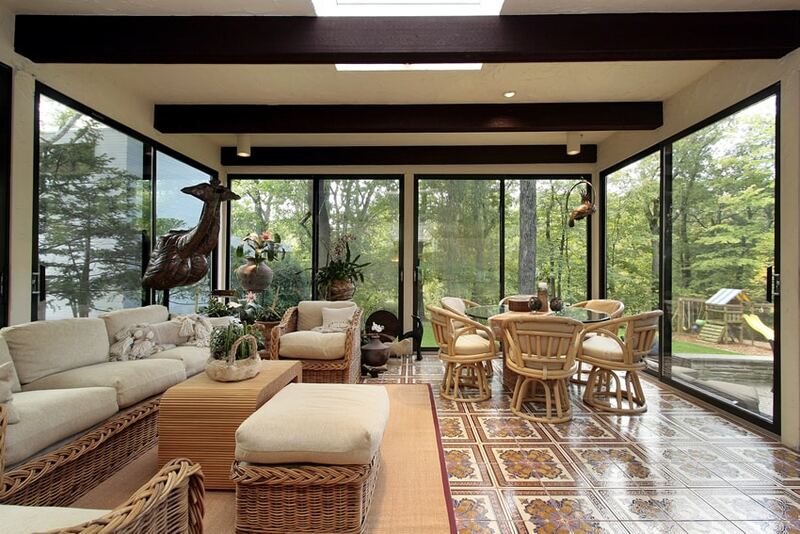 This sun room is more large and expansive than the previous examples. This room has a rounder shape with walls mostly made up of large windows with beige frames. It also has an elegant ceiling with glossy wood planks finishing and even a skylight to add to the drama of the space. Inside, it features a fireplace, dark stone flooring and rattan furniture pieces. 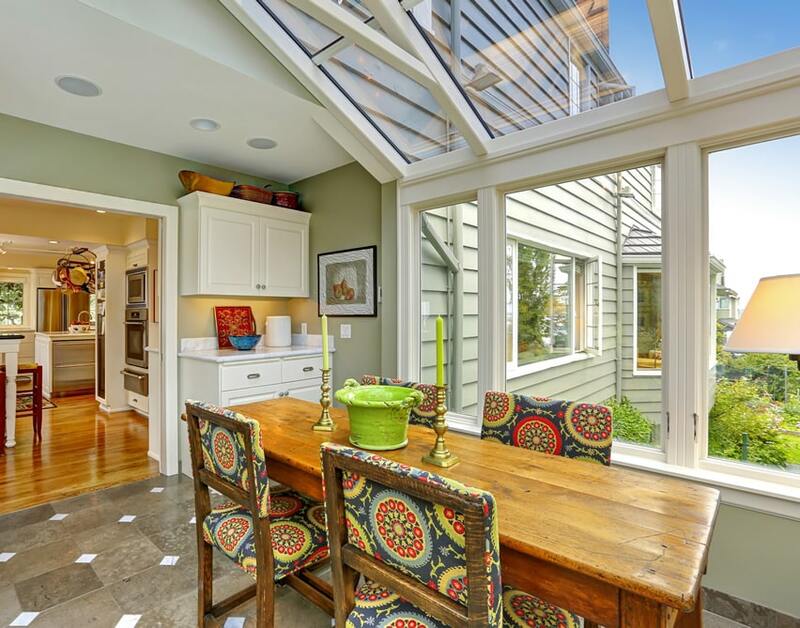 This is a gorgeous sun room which serves like an extension of the dining room. It combines large picture windows with skylights, providing a well-lit environment. It has a solid Teak wood dining table with antique dining chairs upholstered with a retro-inspired fabric. This photo is another view of the sun room above. In this photo you will see how the room is able to provide the best amount of natural sunlight into the space as it combines full-window walls, but also a full sky-light roof, all with clear tempered glass. In addition it features a stainless barbeque with range hood, and just out of view is a counter for kitchen storage. This sun room has a boho feel to it with its natural red wood walls and the combination of different colorful printed fabrics. It is surrounded by large black-framed sliding windows and furnished with different styles of furniture, enhancing the “boho” look of the space. 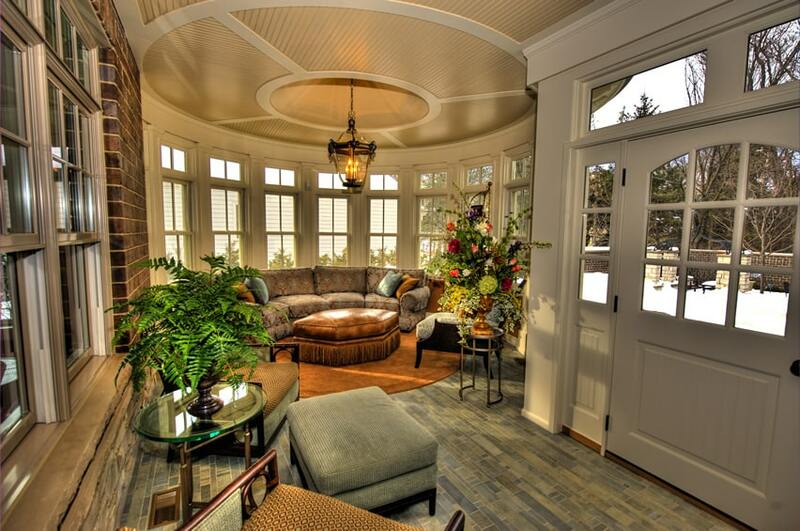 This sun room sits in a quiet corner of the house and is in a circular shape. It has green stone tiles for flooring with a circular area rug to go along with the room’s shape. The sofa used is also circular to conform wit the room’s shape and it has a nice detailing on its ceiling with wood painted wood planks. 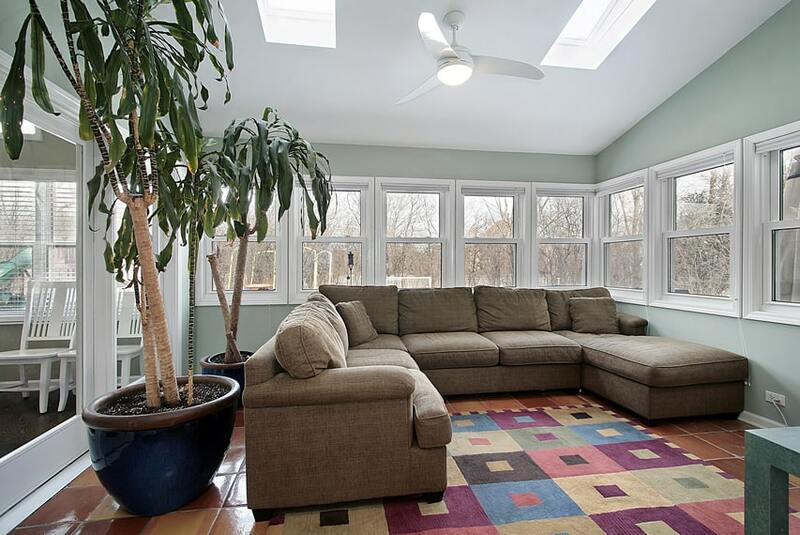 The high ceiling of this sun room combined with white floor tiles makes it look even more spacious. It has large French doors and widows in the room combined with skylights. The walls are also finished with wallpapers to give the room a more dainty look. For the furniture pieces, it has two rattan sofas, a metal coffee table and upholstery which matches the window swags. Small sunroom ideas often benefit from installing large windows to maximize views and help give the appearance of a larger space. 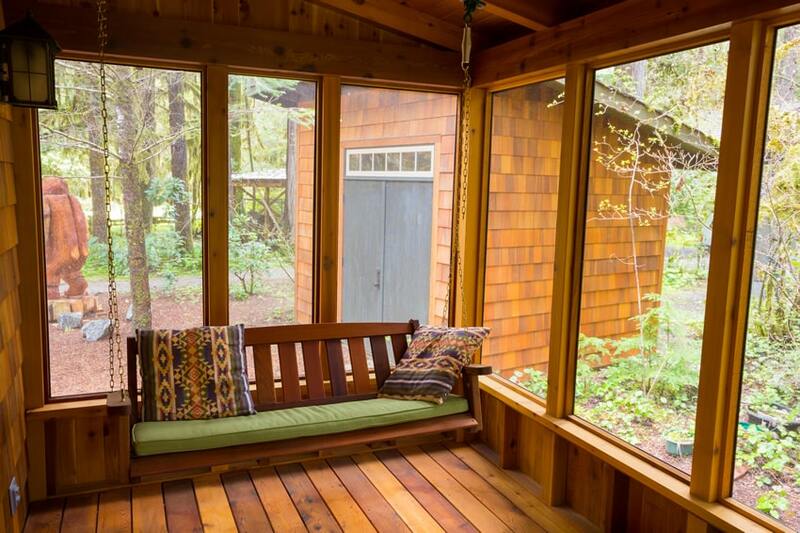 This small sun room as a more warm atmosphere with its use of natural wood for the finish and construction of its walls. These light finishes are combined with light-colored furniture pieces as well, making the room look bright and airy, especially in combination with the large windows. 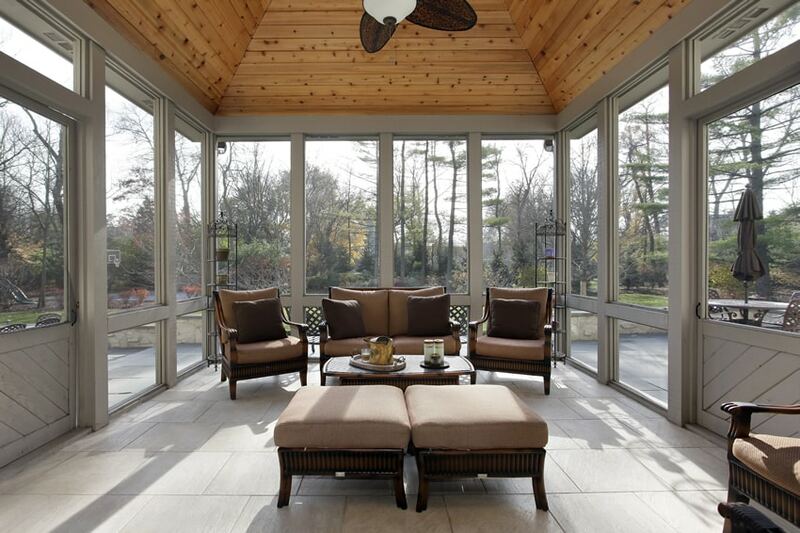 This modern sun room combines it modern architecture with traditional finishes. The Flat walls and modern doors are combined with Moroccan tiles giving the room more personality. There are also exposed wooden beams on the ceiling and a combination of wicker furniture and bent wood furniture pieces, all kept in a light natural finish. 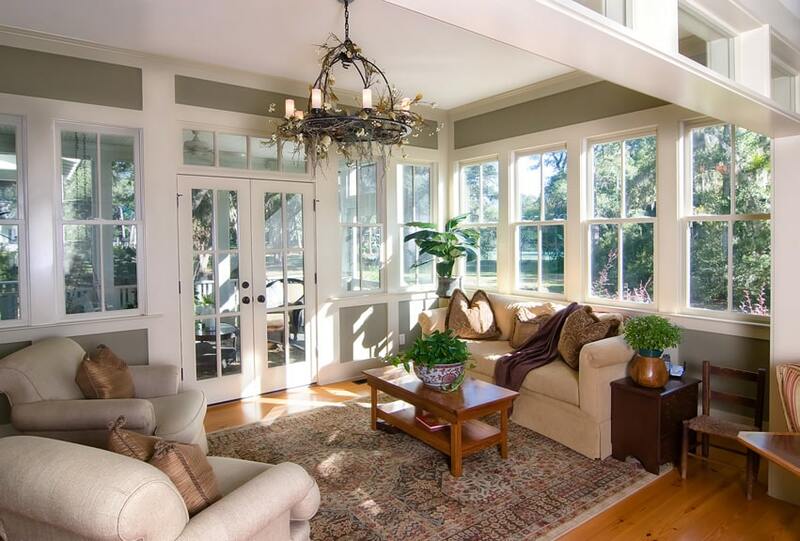 This large sun room has a warm log house feel to it as there is an abundance of wall finishes. Walls are made out of vertically-arranged timber in an orange-tone wood stain which matches the timber ceiling trusses and planks. Flooring on the other hand is of Golden Oak, and the brick fireplace helps add variety to the finishes used in the room. Furniture pieces are all fully upholstered in different fabric varieties: leather, texture and printed. 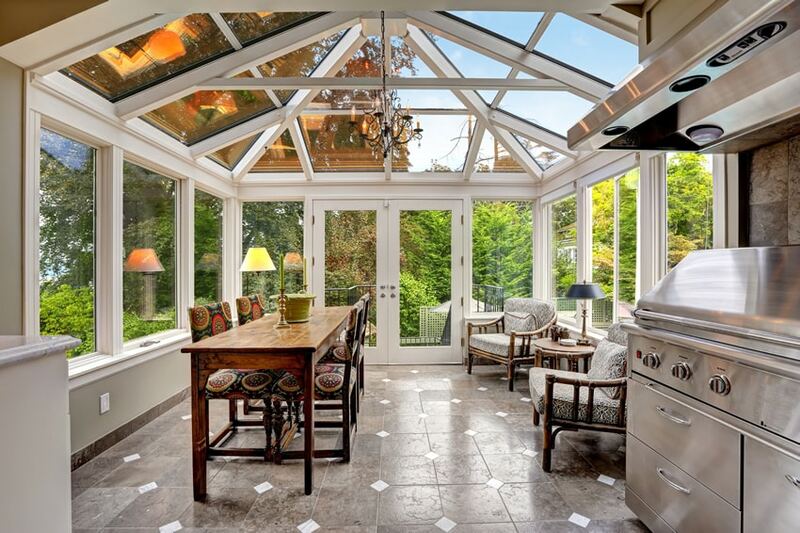 Some sun rooms ideas boast of large floor to ceiling picture windows, but this one boasts of windows which goes up to the ceiling, creating a small greenhouse-like space. Inside, it is kept simple and minimal, with off white walls and a set of metal cafe chairs with a round glass table. 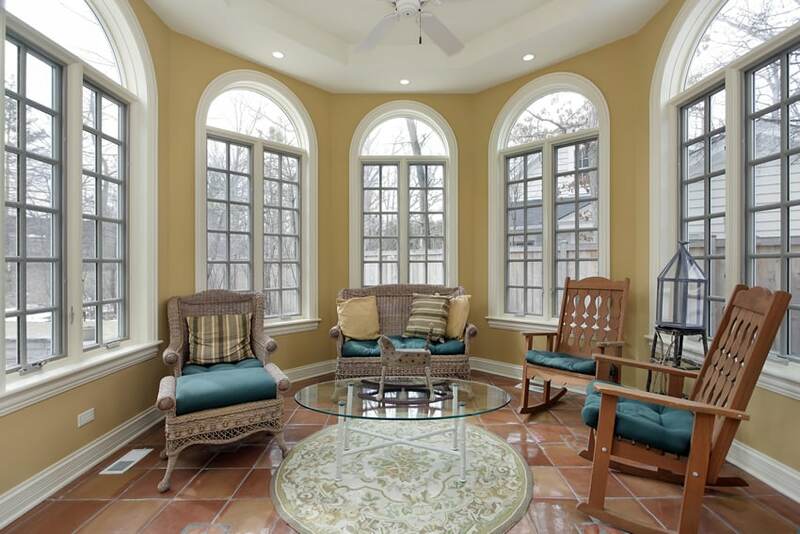 This sun room is also quite large, surrounded by large casement windows, yellow-painted walls and terracotta colored floor tiles. It has a sofa in a natural rattan finish, with a wooden coffee table, a desk with bent wood chairs and some plants to give a more homey feel to the space. 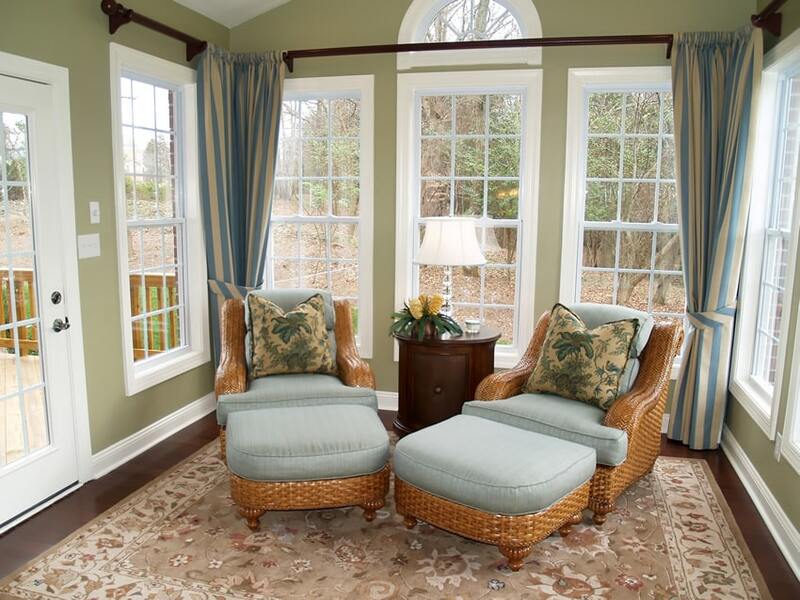 This is a narrow sun room with large picture windows styled like French windows. It also has skylight roofing, making the room bright and warm. Inside, the walls are painted in a light yellow color and furnished with four wooden folding armchairs and a matching round dining table. Unlike the previous examples, this sun room is surrounded by smaller casement windows which runs through the whole surrounding walls. The walls are painted in a mint green color and floors are a combination of red-orange and orange ceramic tiles. It also has one large u-shaped sofa and large indoor plants to complete the look. 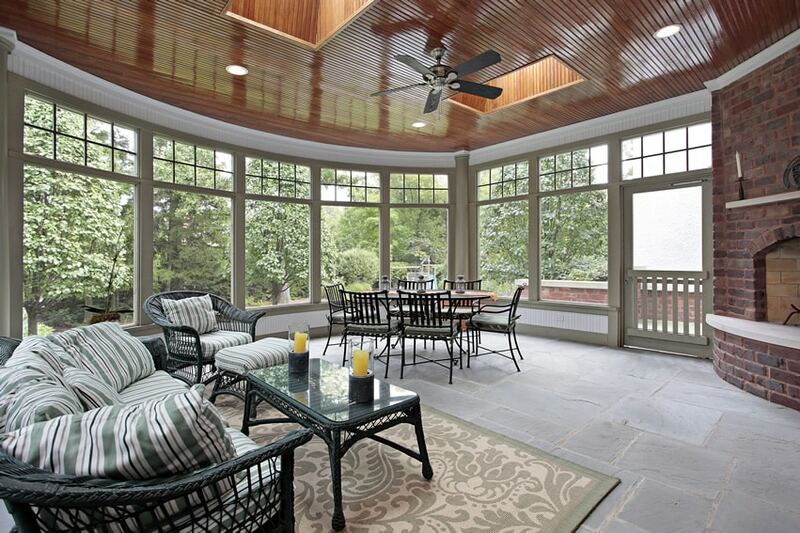 Another patio converted into a sun room. 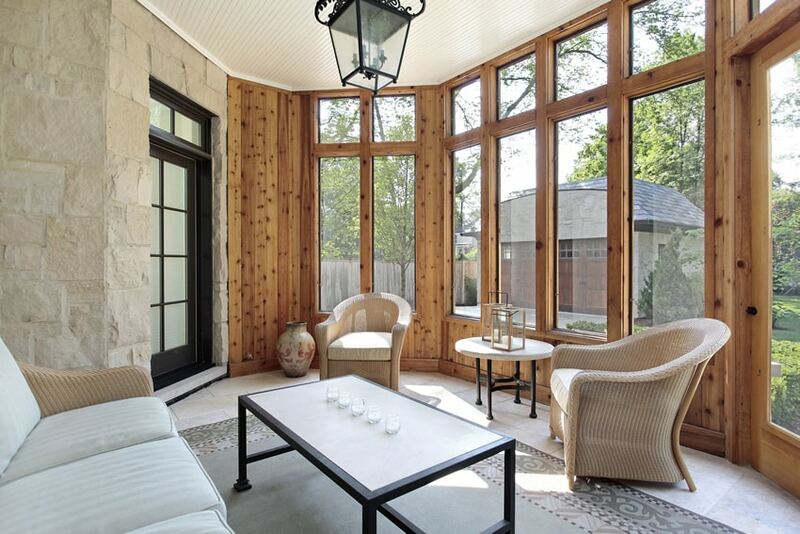 This sun room has a provincial/country appeal to it with its brick pavement floors and walls with gray wood sidings. It also has arched French doors and floral printed upholstery fabric combined with rattan and iron furniture pieces completing that romantic vintage country look. A bright and sunny sun room which uses a bright yellow paint to its walls, creating a “cheerful” atmosphere to the space. Horizontal blinds help control the amount of sunlight going into the room. The furniture pieces uses a floral fabric upholstery making the room have a feminine romantic appeal. However, rustic decor like the antique clock collection, Tiffany style lamp, and civil war era musket offset the feminine feel. 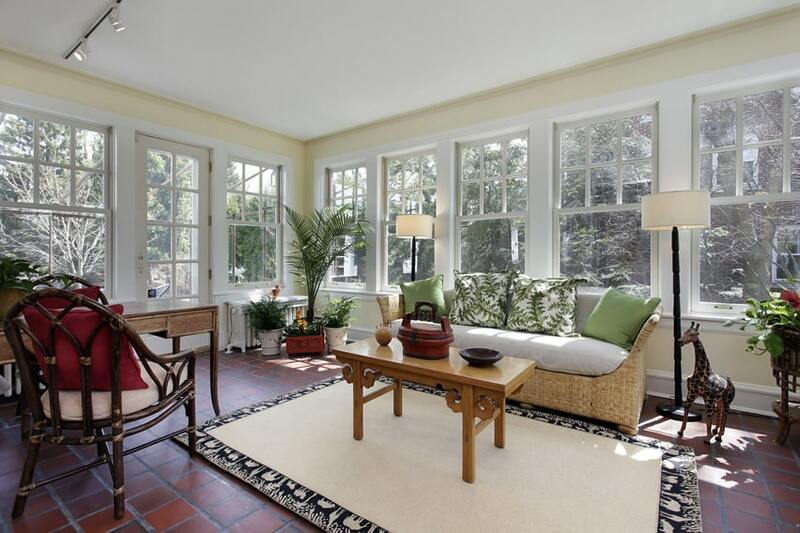 This sun room sits in a quite little corner of the house, surrounded by tall picture windows. Walls are painted in a beige color making the room look brighter and the ceiling is finished with narrow wood planks. It has rattan furniture pieces in a black paint finish and a combination of plains and prints for its upholstery. Wood vaulted ceilings with a small skylight is a nice touch that adds visual interest and personality to the space. A simple sun room which sticks to the basics – a combination of beige and whites to make a universally-attractive room. Walls are painted in beige, with white French windows, while furniture is a combination of fully-upholstered pieces with one rattan accent piece, all upholstered in white and beige striped fabric. 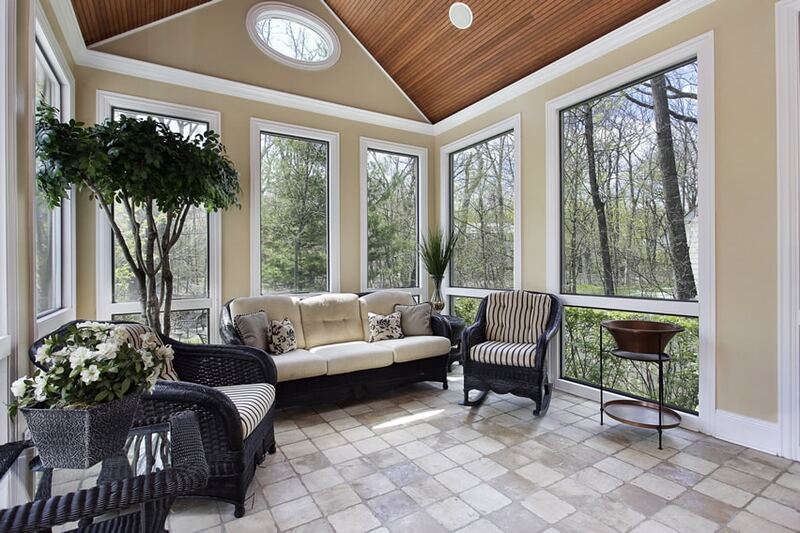 Many sunroom ideas start out as outdoor patios and are walled in to create a comfortable indoor living space. As with the previous example, this is another patio converted into a walled sun room. Its floor to ceiling windows provides the space with a good view of the outdoors, provides sufficient indoor lighting, making you feel like you are outdoors even if you are inside. As the walls, door and window frames and flooring are all in gray, it could tend to be a little too cold, and so the timber-finished ceiling adds more warmth and interest to the space.